Chenda Melangal: is the most popular and widely acclaimed keshtra vadhyas of Kerala. 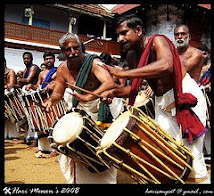 More than 300 years old melam is an integral part of all festivals in Kerala irrespective of cast or religion. The most important among these melams are "Pandy" (Splendid &Majestic) and "Panchari" (sweet & pleasing) which may extent up to 5 hours. The leading instrument is "Chenda", Kerala's own instrument. 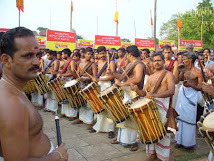 The Chenda is divided into "Valamthala Chenda & Edamthala Chenda" (right & left side of the instrument) or "Veekam Chenda" & "Uruttu Chenda". The covering is soft in Edamthala but in layers in Valamthala. Chenda can produce multiple vadhyas the "Devavadya" using "Valamthala" and Asura vadhyas through "Edamthala". With infinite range & magnificent sound "Chenda" is above all 18 instruments. Chempada Melangal: Generally there are 7 types of melangal viz: Panchari, Champa, Chempada, Adantha, Anchadatha, Druvam and Pandy. The earlier 6 melams are called " Chempada melangal" and they are one way or other closely associated and the model is the premier one "Panchari". Of all "Pandy" stands distinctive. Two more melams, "Navam" & "Kalpam" were developed by a Maestro in the field Sri Kumarapuram Appu marar. There are few artists to perform all these melangal at an equal ease with total dedication, interpretation, meditation, skill & talent. Instruments :Chenda, Kurumkuzal, Kombu, Elathalam . "Uruttu Chenda"- To lead the orchestra. "Kombu & Kuramkuzal" To keep the orchestra with in the prescribed limits and to blend & balance. The melangal are performed in a tight format without any compromise and each and every instruments has equally important role to perform and the conductor will see that all are in tune &time with one another. The no: of artists: Kurumkuzal & Kombu may be in equal numbers with "Uruttu Chanda", Elathalam must be in double and "Veekam Chenda" should be triple the numbers of "Uruttu Chenda". The ratio of "Veekam" to "Uruttu" may be 1:6 for magnificence. The positions are arranged such way that to have a direct interaction between the artists. "Kurumkuzal" is holding the wand supported by the "Kombu" so both these artists must have direct Eye contact with the Leader. Common features : All these Chendamelangal have common Features like same instruments are used, positions and duties are same .Performed in ever increasing tempo and the proportionally decreasing number of beats in the cycle. The role of the "Pramani" and the hierarchy are identical in vadhayam & melam. PANCHARI: Performing on Chenda with one stick and hand (R&L) is the simple identification of this form. Divided into 3 steps in 5 "Kalams" the concert starts at 96 "aksharakalam" and ends at 6 "aksharakalam". The 3 steps are classified through the mode of using the stick. The first one "Nerkol" ( slow) is beating directly perpendicular to the surface of Chenda. On to second step both beats are in swinging mode with a slight inclination. The second stage is called "Thakkida" (Normal)and third as "Kuzamarinja" kalam (Fast)step. The wrist of the hand will fully rotate in the third. "Kalamidal" ( take off) is the foundation of Panchari and the blue print will be ready after the "12th chempada vattam" (Aksharakalam" divided by 8 is one chempada vattam). The melam starts (airborne) at the second part of Vilambakalam (pathikalam) - called Varthikam. The melam smoothly travels to 2nd , 3rd 4th & 5th Kalam ( in 6,3,1½,3/4 – chempada vattams)and completes in "Theerukalasam". The 5th kalam is entirely different & more jubila. Listening to "Panchari" the melam with an eminence" is like watching the Tidal waves from shore. Thalam :Chempada till 5th Kalam, Panchari in 5th again chempada in "Theerukalasam" Ragam : Sankarabharanam. PANDI: Clearly perceptible, widely acclaimed, "pandimelam" attained towering heights due to its performance in "Elajitharamelam" of Paramekkavu in Thrissur pooram. 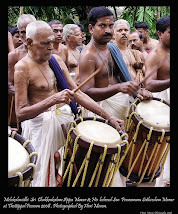 The pandimelam is distinct from other Chenda melamgal. The fundamental change is the use of stick in both hands. Pandi is like climbing a stair case. No. Of Steps + Landing again No. Of Steps + Landing and finally at the top of the tower (explosion of sound) The "takeoff" is in an entirely different format called "Kolumbal/Koottiperukkal" which is an enchanting experience. It is difficult to confine " Pandy" to "kalam" or "Aksharakalam". The pandy is designed in such a way that it is accelerating step by step very systematically. During the course of time it will cover up the kalams, not strictly time- bound. The beauty of Pandy is its "Kalasams". Normally after 4 Thalavattam " "Kalasam" is performed in 3to 6 thalavattams (Subject to the speed of the melam). kalasa thalavattangal is done through "Nerkol" which shows the nobility and depth of the Pandi. The speed and no of beats are directly proportional. 100 and odd Chendas in "Nerkol" complemented by another 50 and odd instruments- the grand finale of "PANDYMELAM"- is a thrilling experience . THAYAMBAKA: This is another illustrative art form in Vadhyakala and more or less a one man show. 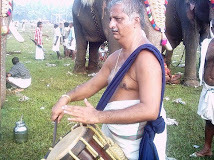 Supported by "Elathalam" the thayambaka is performed in "Chenda". Classified as a temple art "Thayambhaka" is staged in between the "deeparadhana" and "athazapooja" Of the temple ( just after the wee hours of the day). The venue is after the "Valiya balikallu" & before the "Balivattom". The programme starts with a typical style "Kottivekkuka" by "Valamthala" Chenda, supported by "Elatahalam". Starting from "Thripuda" and turning to "Ekathala" ( eka means one) the melam enters the last phase of the preface of "thayambaka" . Here enter the master of the ensemble and positions at the center and beats twice and the concert starts. From "Pathikalam" (slow pace - Chempadavattom) "Thyambhaka" steadily travels though various steps like "Kooru" "Edavattom" 1st stage & 2nd stage ," "Edanila" & "Erikida" . Here the "Thayambhaka" ends with a shower of downfall. Single/double/ triple/ penta "Thayambhaka" - According to the no. of "Pramanies". The no: of "valamthala & Elathalam" may be increased but the "Edamthala" remains on two. Some masters & their way of handling " thayambhaka"
Pallavoor Appumarar & Kunjukuttan Marar, Pookattiri Divakara Poduval,Thrithala Kunjukrishna Poduval &Kesava Poduval are some of the masters in this field with proven track record. VALIYAPANI: Instruments used are SANGHU, CHENGILA, ELATHALAM, KOMBU, KUZHAL, Chenda & maram. There are two type of pani –big and small. Valiya pani is again divided into saivapani & vyshnavapani. The earlier is nearly extinct and latter is used during festivals only. In a nut shell: Advaita Vedanta is considered as the culmination of rational thinking in India. The absolute of this philosophy can be represented by the syllable "Aum". This is also known as "Pranava".The real point of this pranava lies in the fourth state which is termed as "Turiya" – the measureless one (amantra).It may be pointed out that these forms of Kerala vadhyangal somehow accommodate this philosophy. Mathematically multiplying odd no. with even no. is "Panchavadyam & Pandimelam (7*2=14). And with even no. with even no is "Panchari (6*2=12).The melam which uses hand & stick-may be considered as "Swathika" (Bramanya) and using both sticks the "Pandy melam" as rajaswa(Kshatriya) combination of these Swathika" & rajaswa is "Pancha vadhyam". The gist of all these is "Thayambaka". One who mastered in "Thayambaka" can perform any talavadyangal.